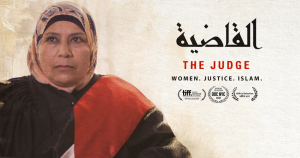 Judge Kholoud Al-Faqih was the first Palestinian woman to be appointed to one of the country’s Islamic Shari’a law courts, which adjudicate on matters of divorce, child support, domestic violence and abandonment. A jovial presence in spite of seemingly insurmountable obstacles to progress, Al-Faqih campaigns to redefine how the frequently misinterpreted Shari’s laws are perceived and implemented, bringing her years of experience as an attorney representing abused women to bear on her challenging and much opposed new role. Tickets are available online here or by calling the IFI Box Office on 01-6793477. The IFI Documentary Festival runs from September 26-30 2018. Join us for five days which celebrate the best in documentary filmmaker from around the world, including fifteen features, our ever popular shorts programme, a panel discussion, special guests and many films receiving their premiere screenings in Ireland. For further information on other titles screening at IFI Documentary Festival, please visit our website.